For many fine jewelry designers their penchant for natural materials runs deeper than precious or semiprecious gems. It passes beyond platinum, gold and silver. It goes into the woods—literally. The biggest names in baubles used wood in jewelry throughout the twentieth century. Van Cleef & Arpels began employing it as far back as the 1930s and still does so today. Elsa Peretti launched her hardwood bangle and lacquer series for Tiffany in the 1970s. JAR has made wood jewels too. The Marquetry collection from Brazilian sensation Silvia Furmanovich is unlike other fine wood jewelry yet it has roots in the past. Marquetry is a technique that dates back to the sixteenth century when cabinet makers joined different shades of wood together in decorative patterns on furniture. During the Art Deco period in France, the technique enjoyed a period of great popularity. When Silvia found craftsmen in Acre, a state in western Brazil, using native wood to create marquetry pieces she fell in love with what they were doing. The work supports sustainability as the artisans find their materials from fallen tree branches and bark in numerous colors. “The marquetry technique lends itself very well for an endless variety of intricate and detailed motifs, which gives a lot of creative freedom,” says the designer. 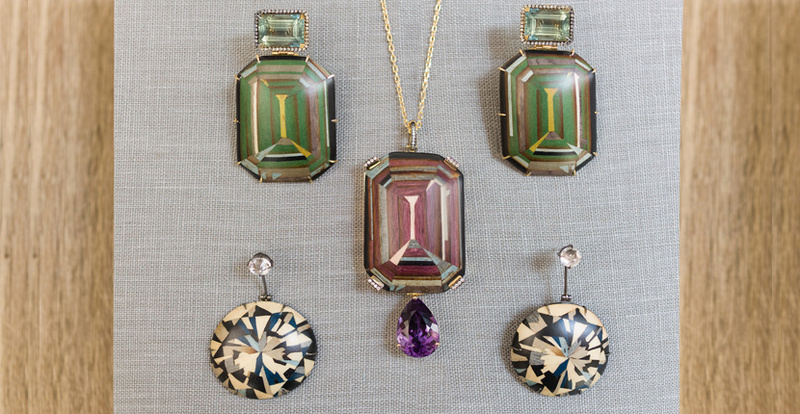 “The material is also very lightweight, which makes it ideal for jewelry.” Some of the most dazzling one-of-a-kind pieces in the collection recreate the appearance of emerald-cut and round gemstones with marquetry. Gold and diamond details and semiprecious stone accents give the opaque woods sparkle.